Engagement rings are meant to last you a lifetime of joy, challenges and experiences. When you make a rushed decision based on trends, inside jokes or impulsive statements, there is a very real risk that you may find that you fall out of love with your ring in a few years. To avoid having to change or replace your ring, make sure that you stay well clear of these hit and miss engagement rings. While two tone rings have plenty of impact in all the right ways, the contrast is a good one. There is a huge leap from a contrasting rose gold and platinum band to a violent red metal band that clashes against a yellow gold setting. Choosing over the top statement metals is always risky. Even if the metal does not clash with the stone or other details on the ring, it may well clash with your outfit on a regular basis. You will certainly get lots of reaction from people... perhaps not the kind of reaction you are looking for, however. Another thing to avoid is strange shapes that distort the size and dimensions of the ring. A StarTrek inspired ring may seem hilarious now, but it may not have the same appeal a few years down the line. Stick to classic cuts and shapes that will not go out of fashion in a year, five years or ten years from now. That will ensure that you don't wake up to find yourself hating your ugly futuristic ring with a passion. On a similar note, it is a good idea to think carefully about ring symbolism. There are many beautiful symbols that cannot be confused or misunderstood. The danger of custom ring design is that it leaves a fair bit to interpretation. To be on the safe side, always get expert advice from an experienced jeweller in Cape Town so that you are 100% sure that your ring symbols are chosen carefully. The exception for this is, of course, any rings that you absolutely adore. Even if the ring makes your finger look smaller or bigger, if you love your ring, none of that will matter. If you are unsure about the ring however, how it looks on your hand should be a good deciding factor. Read our tips on choosing the right ring for your hand to find out what to look for when trying on rings. That elaborate, massive ring may look good on paper. In reality, however, over the top rings only really work for celebrities. There are many risks to wearing ridiculously detailed rings. The more expensive and flashy your ring seems, the more carefully you will need to guard the ring. Very detailed rings can also be more likely to break, lose stones or be hard to clean, too. On a similar note, you should also stay clear of impractical rings that are not easy to wear. These may look amazing, but they might not be comfortable. Some may snag on clothing and other fabric. Others may scratch surfaces with only the slightest pressure. A few may leave ugly impressions on your skin of your ring finger or even your adjoining fingers. Two tone engagement rings are creative, interesting and eye-catching for all the right reasons. 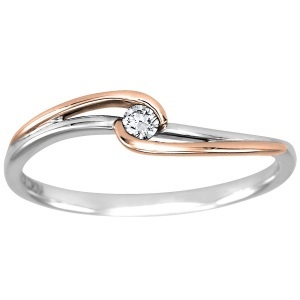 This type of ring has many variations that further add to its appeal. Whichever stones and metals you choose, there are many ways to use this style for your dream ring. 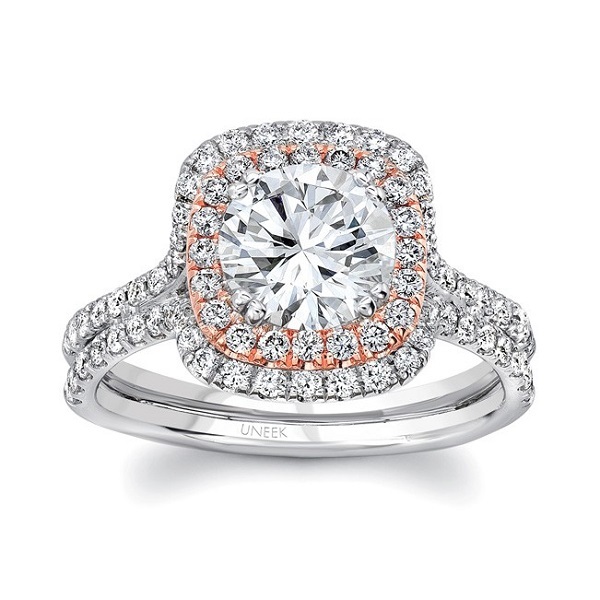 Keep reading to get some inspiration on two tone engagement rings that are sure to dazzle. The two tone effect works especially well on stacked ring sets. This is a simple way to add visual interest without changing the entire ring. Instead, fine rings are stacked to form a single ring. Engagement and wedding rings of contrasting metals can be worn together, resulting in a beautifully multi-tone ring that can be adjusted to add impact or provide a subtler look. Pave and cushion cut rings look beautiful when contrasting metals are used. The trick here is to add a tiny bit of contrast that does not take away the effect of the cut. 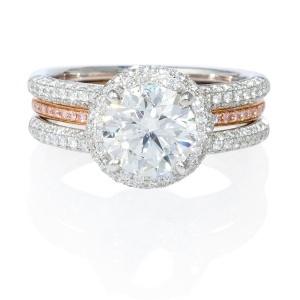 A double cushion allows you to add a contrasting band that is either left plain or enhanced with tiny pave stones. This style works well for round halo cuts as well as princess or cushion cuts. The simple solitaire ring is given a bit of impact through a contrasting setting. 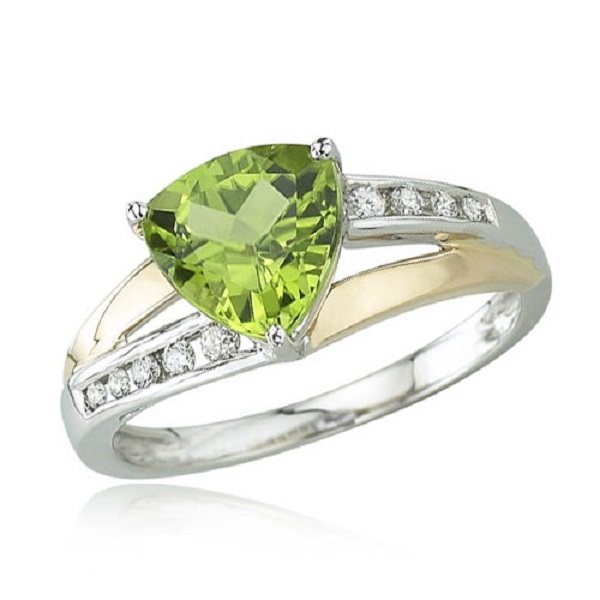 This style is ideal if you love the idea of two tone rings but don't want to go over the top. You could pair gold and platinum, white and yellow gold, white and rose gold, or even yellow and rose or black gold, depending on your preferences. The round setting can be replaced by contrasting prongs for a subtler look. 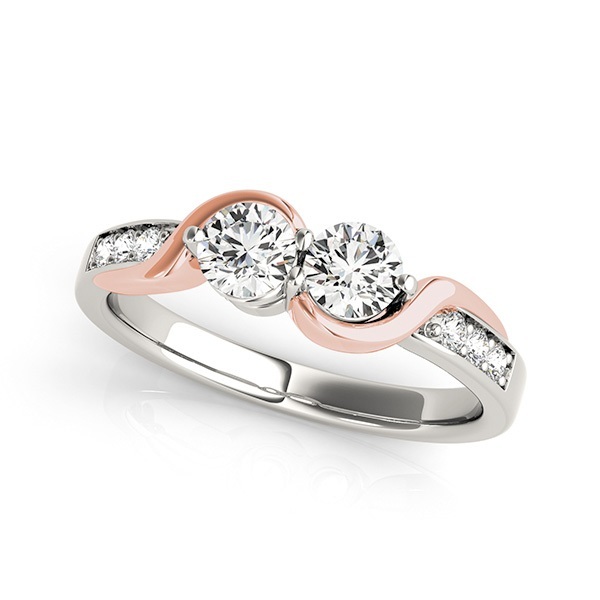 If delicate and minimal rings are your cup of tea, you will adore this feminine ring. Contrasting strands wind around a tiny centre stone, with a few pave stones on the band to add extra sparkle. This style is ladylike and simple, working well in just about any metal. For added impact, you could try a coloured diamond or even a statement stone such as a Tanzanite, sapphire or ruby. Much as three stone rings represent the past, present and future, two stone rings are also loaded with symbolism. These rings represent the bond that you have with your love. There are many ways to add impact to this ring. Choose a delicately weaving band in a contrasting metal, or add different coloured diamonds or precious stones for even more detail. 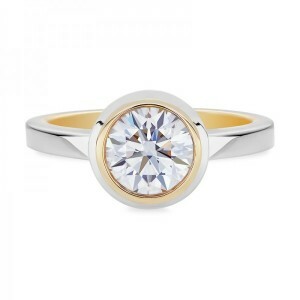 Simple, clean and oh-so-modern, this ring is perfect for brides who lean towards contemporary styles. The band does not only contrast in metal but also in shape. The result is an eye-catching ring that is surprisingly understated. You could add a bit more drama to this ring by choosing a coloured diamond as the centre stone or adding coloured pave stones. 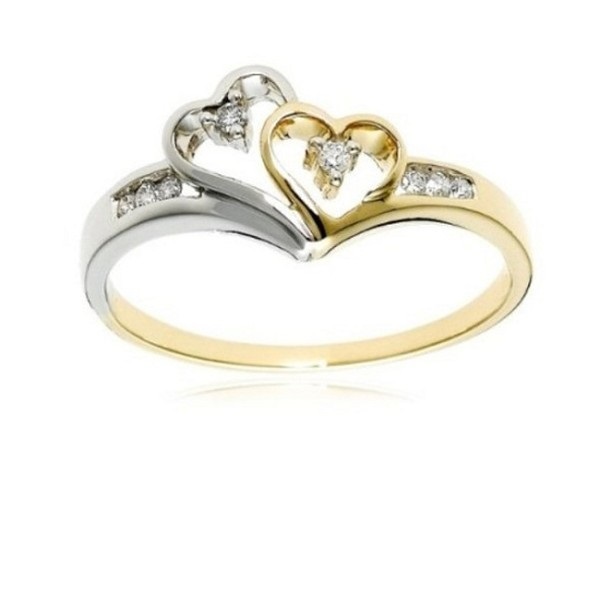 Perfect for romantics, these two intertwined hearts in contrasting metals are adorable. Delicate pave details on the bands further add to the charm of this ring. 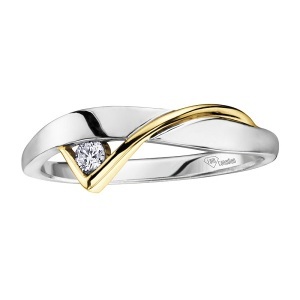 You could choose any combination of metal and stone and still enjoy a truly lovely ring. In gold and platinum or white and yellow gold with diamond, the effect is super feminine. The classic split band ring gets a fresh update with a two tone effect, pave stones and a vibrant trillion cut citrine stone. 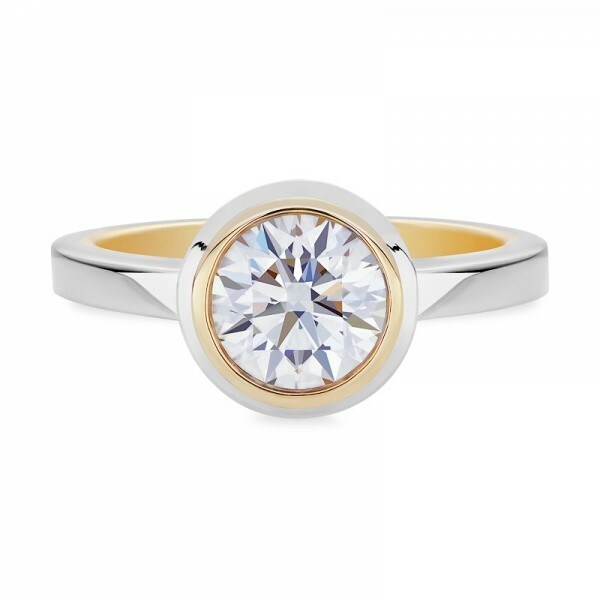 Choose a high impact, unusual centre stone to maximise the drama of this ring, or opt for something softer, such as a chocolate or beige diamond. 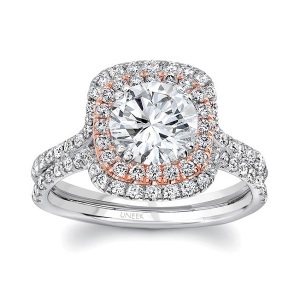 Here at Cape Diamonds, we can turn your dream ring into a reality. If you're looking for beautifully made custom engagement rings in Cape Town, get in touch with our team today!